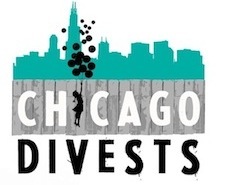 Blog to End the Occupation: Join TIAA-CREF Vigil in Chicago! Chicago Divests, a coalition that includes US Campaign member groups American Friends Service Committee, The Committee for a Just Peace in Israel and Palestine, and Jewish Voice for Peace, is holding a vigil this Friday, June 29 at 12pm in Chicago (200 N LaSalle Street) to recognize TIAA-CREF's recent divestment from Caterpillar and urge the financial firm to continue divesting from the Israeli occupation of Palestine. TIAA-CREF, one of the nation's largest retirement fund providers, invests $2.3 billion in corporations profiting from human rights abuses in occupied Palestine. After years of grassroots campaigning and shareholder pressure, TIAA-CREF removed Caterpillar from its Social Choice Accounts last Thursday. Caterpillar provides bulldozers to Israel military and civil authorities for the systematic destruction of Palestinian homes, orchards, and businesses. Caterpillar used to enjoy $73 million of financial support from TIAA-CREF's social choice accounts, which are designed to "favor companies with a 'best-in-class' record on environmental, social and corporate governance issues." Now, TIAA-CREF can no longer claim that Caterpillar's facilitation of ethnic cleansing is compatible with "financial services for the greater good." We applaud TIAA-CREF for recognizing Caterpillar as an ethically irresponsible investment and for giving its clients the option of a Caterpillar-free Social Choice fund. Find more information and RSVP on Facebook. The Presbyterian Church-USA will be voting on divestment from Caterpillar, Motorola Solution and HP in the next week. Almost 4,000 people have already signed a letter supporting the divestment recommendation and you should too. Make sure to join us for our 11th Annual National Organizers' Conference September 21-23 at St. Louis University to learn how you can get more involved in BDS and other efforts to change U.S. policy toward Palestine/Israel.